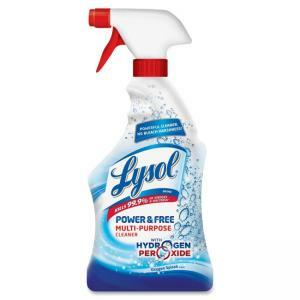 Lysol multipurpose cleaner with no bleach harshness kills 99.9 percent of viruses and bacteria when used as directed on hard nonporous surfaces. This hydrogen peroxide formula releases thousands of micro bubbles that penetrate to dissolve tough grease and soap scum without the harshness of chlorine bleach. Lysol Power & Free Multipurpose Cleaner leaves only a fresh clean scent and no harsh chemical residue so no gloves, masks or protective eyewear are needed. Use on washable walls, garbage pails, countertops, highchairs, changing tables, sinks, stovetops, cabinets, refrigerator exteriors, bathtubs, sinks, shower doors and toilet bowl exteriors. Cleaner is EPA-registered and offers an Oxygen Splash scent.